Kathryn Le Gros on Piano and clarinet. Diane Berry plays and teaches chamber music. 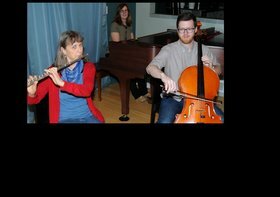 When living in Smithers she became a founding member of a trio--two Flutes & a Violin, who continue to play together, performing across the north as well as in Victoria. While working with the trio she also began composing, first for the trio, then began to branch out with works for other ensembles. Some of her piano music for students can be found in Mayfair Music’s Northern Lights Series. In 2011 her piece “A Northern Winter’s Night received an honorable mention in the International Association of Women in Music’s Search for New Music. Nathan Jacklin enjoys a versatile career as a performer, teacher, arranger, and as a conductor. He received his BMus and Diploma in Education from the University of Victoria, studying with Pamela Highbaugh-Aloni of the Lafayette String Quartet. In 2013, Nathan was appointed the music director of the Juan de Fuca Community Orchestra. He is also the associate conductor with the Civic Orchestra of Victoria. Nathan is a founding member of the Victoria Cello Quartet, principal cellist of the Civic Orchestra of Victoria, and performs regularly with a variety of ensembles on Vancouver Island. A dedicated teacher, Nathan teaches music at Oak Bay Secondary School and is in demand as a strings clinician in Victoria. Kathryn Le Gros Kathryn enjoys playing piano and clarinet in chamber music and other small ensembles. She co-founded the Kitchener Waterloo Chamber Orchestra. In Victoria, she has played in classical and jazz quartets and quintets, as well as performed with singers and other instrumentalists. Recent performances on both clarinet and piano include An Die Musik (an evening of Schubert music) and Spring Romantique with cello and singers. In addition to her music pursuits, Kathryn had careers in downtown management and postsecondary education before recently retiring. Come on your own/bring along friends & family for this wonderful evening! ** PS: By bringing your own mug for tea/coffee you will help us become an even more environmentally friendly coffee house !